SKY News yesterday was all over Kevin Rudd’s movements on the day he announced the election, with David Speers and Kieran Gilbert hosting from about 1:30pm until evening, including tracking the PM’s plane as it headed for Canberra. There were cameras following him from the airport to Yarralumla and Parliament House, with reporters also on the hustings with Tony Abbott in Sydney. SKY News had also offered a debate to take place in Sydney tonight which Rudd had accepted but appears unlikely to occur. 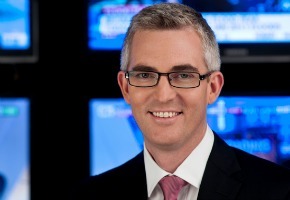 The award winning SKY News Political team including; Political Editor David Speers, Chief Political Reporter Kieran Gilbert, Helen Dalley, David Lipson, Laura Jayes and Tom Connell will provide the most comprehensive coverage in the lead up to September 7. Joining them will be SKY News commentators Paul Murray, Chris Kenny, Peter Van Onselen and Graham ‘Richo’ Richardson who will ensure SKY News viewers have the most dynamic and in-depth analysis of our nation’s political news. The team will be supported by the extensive SKY News network of bureaus in Sydney, Melbourne, Brisbane, Adelaide, Perth, Darwin and Hobart, giving viewers access to the latest developments from the campaign trail as it moves across the country. SKY News Multiview will also provide Australia’s largest selection of political channels. At the touch of the red button, viewers can launch eight simultaneous split screens of video and text including two channels dedicated to the activity and movements of Kevin Rudd and Tony Abbott. In addition to The Perrett Report, currently airing weeknights at 7pm on SKY News Business, Janine Perrett will anchor Saturday Live on SKY News National at 9pm, an expansion of the popular Paul Murray and Friday Live brand. For the first time in SKY News history viewers will also be able to keep abreast of Election 2013 with a new offering of multi-platform viewing. Using the Foxtel Go App, SKY News will be free for all Australian’s during the campaign. The app is available on iPhone, iPad, iPod Touch, iPad mini and now Samsung Android tablets, smart phones and PC and Mac computers. For those that can’t tune in, SKY News has also launched a dedicated webpage www.skynews.com.au/election and continues to keep social media users up to date with breaking political news via @SkyNewsAust and www.facebook.com/SkyNewsAustralia . Full details of SKY News Election night coverage will be released closer to polling day. @ Laurie Just because the ABC Questions the Liberal Party and Tony Abbott as well as Labor and Rudd, doesn’t make the ABC Labor Bias instead it means the ABC are doing their job hiring Journalists who ask the tough questions for the Good of all Australians so we can make an informed decision, while Sky News hire Far Right Wing Opinionists and Former Liberal Politicians to do nothing but cheerlead the LNP. Why would Abbott want to debate Rudd on Sky News? It would take away 2Hrs of the usual Liberal Opinionist propaganda. It’s a Lose,Lose for Abbott. Wonder if Sky News will have a countdown to the “Election of Tony Abbott”, like the Australian website had this morning. Granted this is filed in pay tv… but credit needs to be given to Ten too. Unlike the past, they were on air for 3 hours on the east coast with full bulletin structure. Crosses to journos in Brisbane and Sydney, as well as Hugh, Paul and Leah in Canberra. Was great to see, more please TEN!